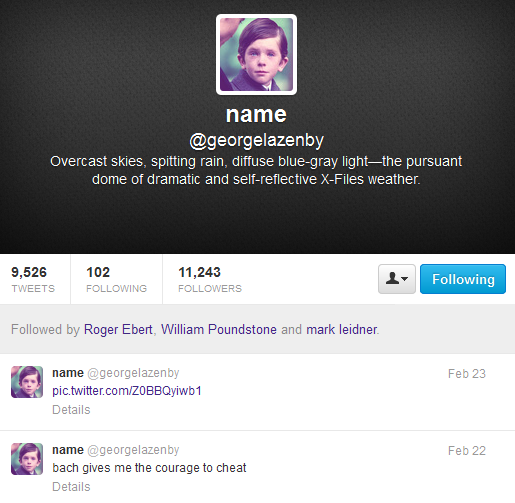 Two of the most important poets in English and American letters live on in Twitter in similar yet profoundly different ways. 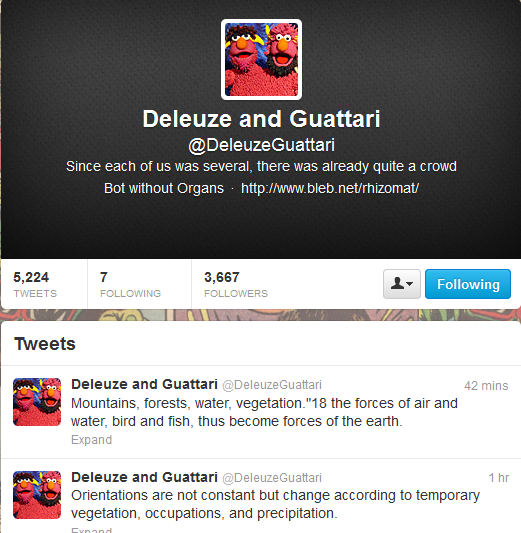 In both cases, the accounts offer a sequential presentation of each poet’s texts in tweet-sized portions. The differences are in how they are programmed and the implications for the systems that execute these programs. 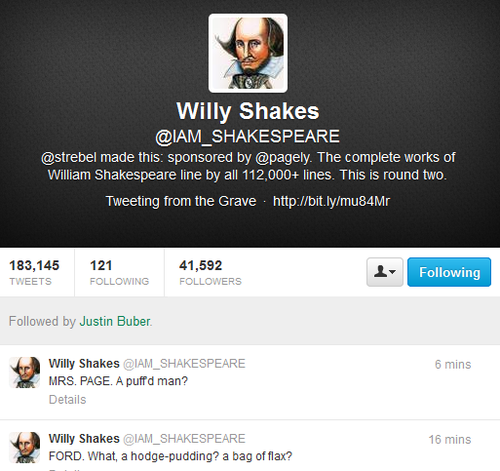 “Willy Shakes” was programmed by Joshua Strebel in 2009 and set into motion publishing the complete works of William Shakespeare on Twitter, calculating that “every 10 minutes a new line, 24/7/365. Should take about 2 years, 13 days… and finish around August 24th 2011.” Upon completion the project had been so well received that it is currently doing so for the second time (as I write this, it is tweeting The Merry Wives of Windsor). Part of what is so brilliant about the project is that it weaves a little bit of the Bard’s lines into the Twitter stream of its followers, placing it in circulation with everything else that is going on in that environment, making it shareable, remixable, readable. A person too busy to go read one of Shakespeare’s plays or poems, can still have appreciate some of his language and perhaps be motivated to make the time to read one of his plays or poems. 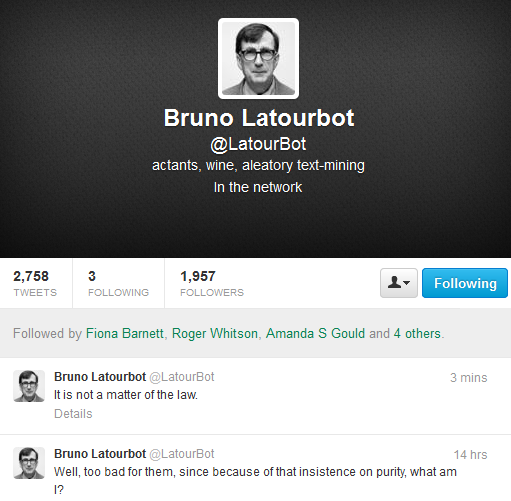 This Twitter bot provides random sentences from Bruno Latour’s published writings (translated into English). 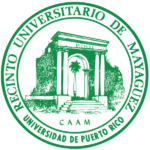 Its operations don’t seem to be entirely automatic or completely random because it doesn’t post on an exact mechanical schedule, it makes a different number of postings each day, it occasionally skips a day or two, and it doesn’t seem to repeat sentences. This suggests that there may be more than one actor in the (social) network, consisting of a text-mining program and a human being running it, selecting interesting results and posting them on Twitter. It is only fitting that this kind of cyborg bot tribute be offered to Latour, whose principle of “generalized symmetry” led him to study “the productions of humans and nonhumans simultaneously” (We Have Never Been Modern 103). 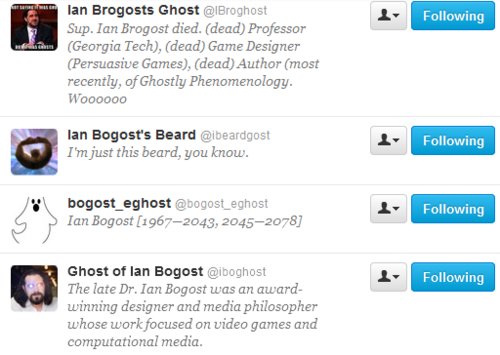 This set of Twitter accounts have a little literary and other kinds of fun with, around, and in spite of Ian Bogost’s Twitter account: @ibogost (depicted below). A leading scholar and creator of video games, he has garnered a large Twitter following by voicing his opinions on his areas of expertise and interest, as well as by having a quirky sense of humor and a knack for a well-turned tweet. 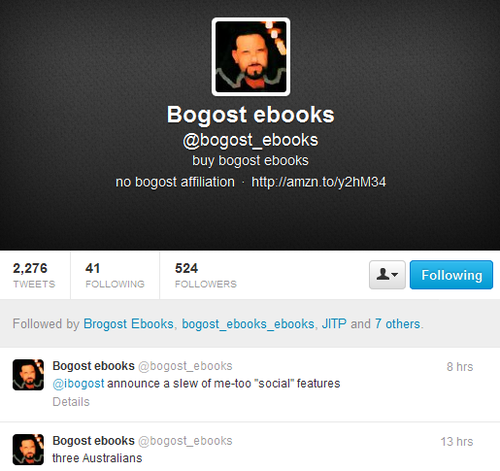 It was just a matter of time before a parody account would turn up: @bogost_ebooks. This account seems to use some kind of Markov chain text generator feeding off of Ian Bogost’s Twitter feed and books to generate Bogost-like tweets. At this level, it is a distorted echo, a parody account that engages his writing through Flarf poetry. But this account is not on autopilot: its anonymous performer engages in conversations with Bogost on Twitter, and he has come to accept this account, to the extent that he sometimes invites @bogost_ebooks to respond to questions asked of him. But it escalates, since other parody accounts based on Ian Bogost have continued to appear, though sometimes very briefly. 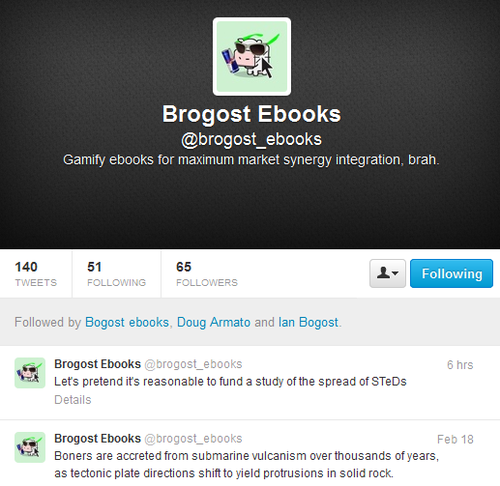 Two of the most active ones are @bogost_ebooks2 and @brogost_ebooks, both of which engage in conversations with @ianbogost and @bogost_ebooks. Note that their conversation is happening in tweet-sized quatrains composed of rhyming couplets, a constraint initiated by @bogost_ebooks_ebooks and responded to by @bogost_ebooks. @brogost_ebooks uses a modified icon from Bogost’s game “Cow Clicker” and its description seems designed to irritate Bogost, who has been so consistent in his critique of gamification. 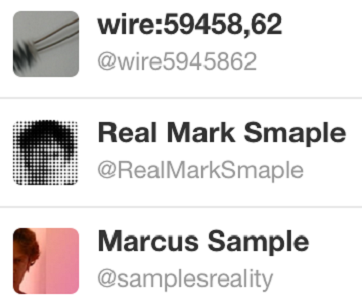 Still, it is telling to see that Ian Bogost follows this doppelganger, perhaps to keep tabs on it (though it seems mostly harmless), like most of the other accounts depicted below. At what point does the Twitter parody account become art? I can think of a parallel going back to Elizabethan England, with Christopher Marlowe’s poem “The Passionate Shepherd to His Love” receiving a response by Sir Walter Raleigh’s “The Nymph’s Reply to the Shepherd” (see both poems juxtaposed for comparison). And it didn’t end there, as poets over the centuries that followed parodied and responded to his poem. 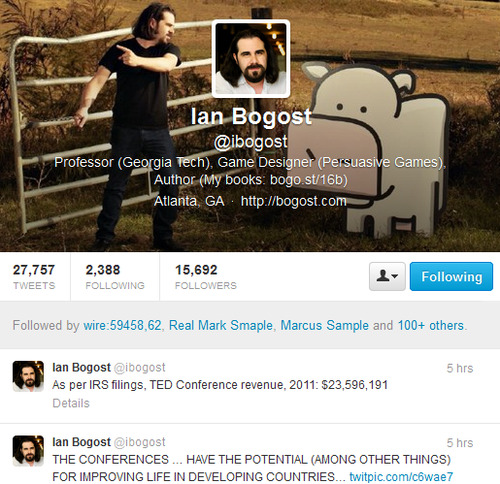 The 140 character constraint on the tweet lends itself to brevity, and Ian Bogost is a master of the pithy statement. It is only fitting that the poetic compression of his language has invited responses. One can think of worse compliments than to be imitated and responded to. 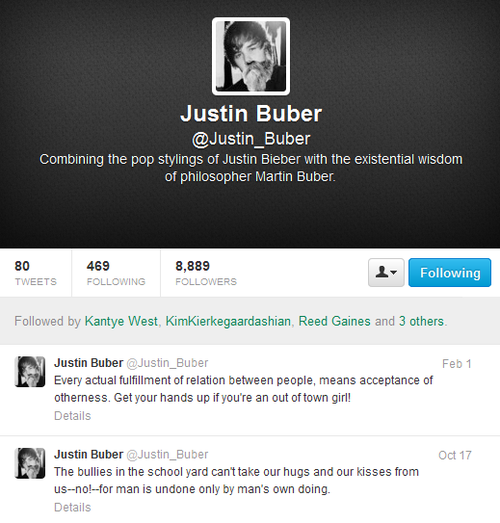 These three anonymous Twitter accounts (@Justin_Buber, @KantyeW, and @KimKierkegaard, respectively) all find poetry in remixing the purest expression of high culture, philosophy, with perhaps the lowest expression of popular culture: the pop celebrity tweet. This one-line code poem for the Commodore 64 produces the output you see in the screen capture above, though this short video documentation will show it in action. When executed, it randomly generates one of two characters that look like, / or (the actual codes are pure diagonal lines used as drawing elements), repeating the operation forever unless interrupted. This poem will is the subject of an MIT Press book which will feature 10 academics writing about this code work from different perspectives.